With these upcycle project ideas you will discover new ways to reuse fabric remnants, wrapping and wallpaper off-cuts, and other household items. It is surprising what can be done with a little resources, a bit of effort and a good plan. You may be able to restore the old piece of furniture and put it with a pride in your bedroom, create an unique presents for friend or family or refresh your home with small additions you have make yourself. And all that can be so affordable and easy to make. So exciting! If you are bored a bit with a look of your bedroom, try to add some beautiful and individual details. 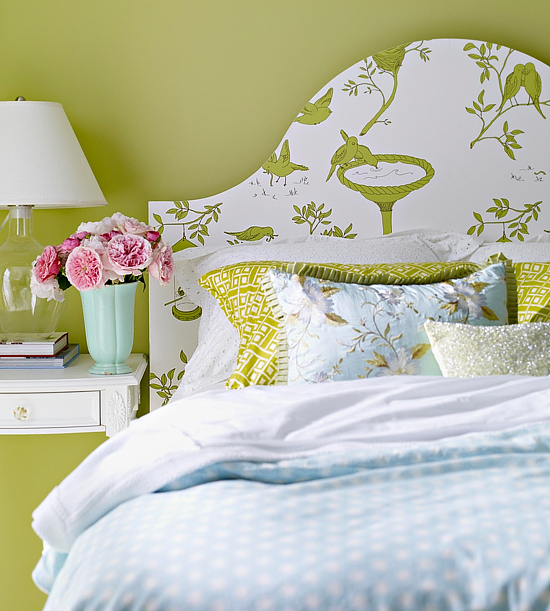 A length of wallpaper makes a striking headboard. On a large piece of parchment paper, folded in half, draw out one side of the headboard, which will be open to a symmetrical shape to make a template to transfer onto a wallpaper. Use wallpaper paste to glue it onto the wall. Voilà! 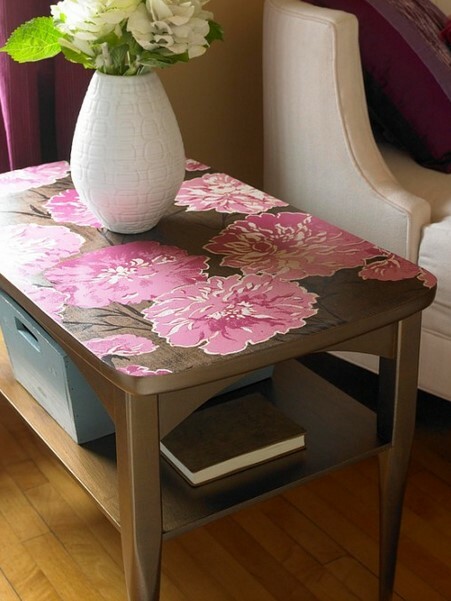 Decorative wrapping paper or wallpaper can be used to give a unique finish to a small coffee table or side table. This idea can work by covering whole areas with one piece of paper, or, if the design allows it, cut out individual motifs to form a bespoke pattern. You can finish the table top with matte or glossy varnish. If you are seamstress, fashion design, quilter or you know someone who is, here is the perfect idea to create something really cute for yourself or as a gift. 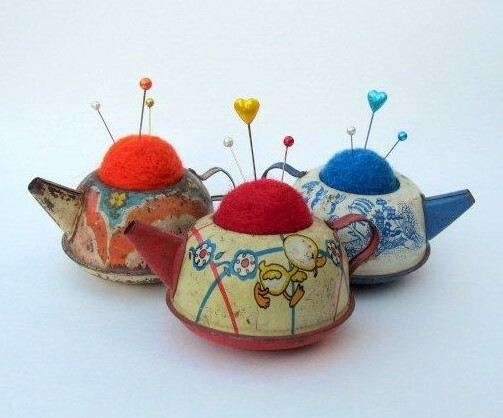 Old tea pots or tea cups turned into pincushion will put the smile on everyones face. Search your garage or loft for long time forgotten china or visit local antique shops, car boot sales or charity shops. Use felting wool to create firm ball, insert it into pot or cup and here is your beautiful pin cushion. Spring is coming and it is always nice to brighten your house with bunches of beautiful flowers. You don’t need to have an expensive vases to lovely present them. A simple glass jam jar will do the job as well. 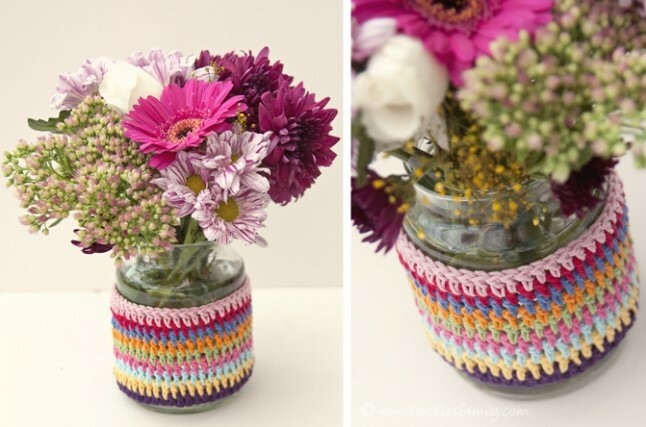 Crocheted or knitted cover for the jars will change the whole experience and enhance the beauty of the flower bouquet. A pair of old chairs are somewhere in your garage and you don’t know what to do with them? 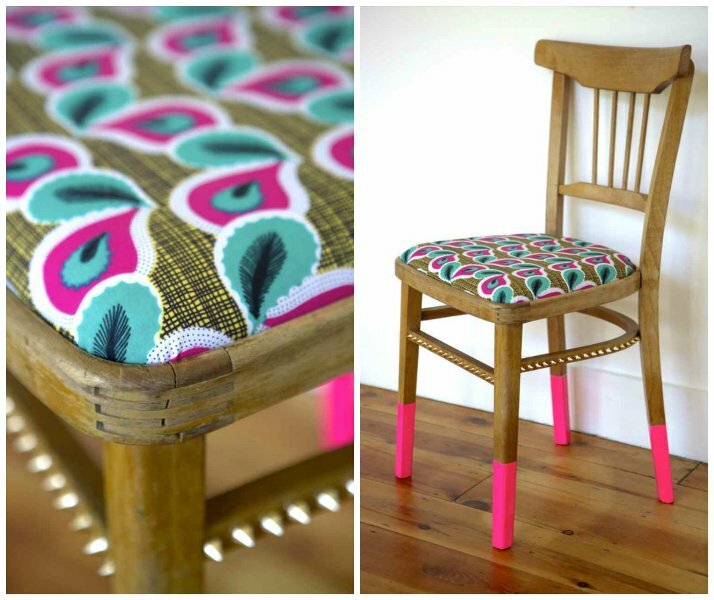 Take a bright and funky patterned fabric, small can of paint and with a basic tools you will be able to do the magic. An upcycled chair can now be part of your interior, and be sure everybody will notice it. Simple things could change your life or, at least, to make you feel better.